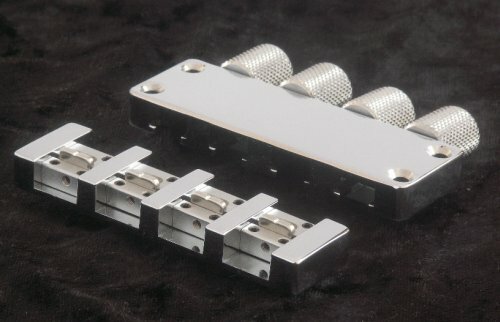 In keeping with ongoing efforts to gather as much as possible on headless guitar bridge parts, here is hardware from German manufacturer ETS – suggested to me by both reader Jelle Schrijver and Martin Koch, author of Building Electric Guitars. 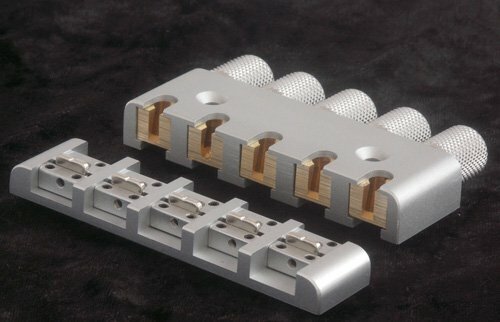 Besides its more standard offerings, ETS makes a variety of headless guitar bridges for both bass guitar and electric guitar. Standard choices range from 4 string to 7 string bridges. These are available in one of two aesthetic choices – an angular look and a rounded look. ETS also made it clear that they are open to building custom solutions if one of their standard offerings doesn’t meet a guitar maker’s needs. 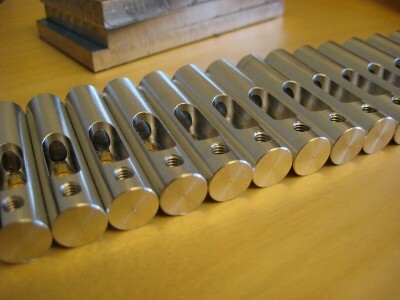 This includes custom spacing, special designs, piezo pickups in the bridge, etc. As they say, “inquire within”. Bridges are available directly from ETS with a lead time of 15 days (not including shipping) for their standard products with payment available through Paypal. Wow… I think they look great! Personally, I like the angular models better but for their lower profile but it all depends on the what you’re going after. Besides appearance, the angular model is a lower profile so that could be a consideration depending on the overall design. Keep in mind that the 15 days is probably for stock items. I’m having a custom piece made by ETS and it’s taking significantly longer. Which is fine since they’re a relatively small company and pretty nice-seeming guys besides; however, be aware that if you have a mission-critical need for the piece, give yourself plenty of time. Also, I have made all my drawings and plans available under Creative Commons licensing, which means that you could make your own as long as you credit me. Thanks for the update Ola! Very impressive and very generous of you to release your drawings and plans under Creative Commons. Here’s my experience with ETS: They won’t even acknowledge you unless you appear to the to be a dealer, luthier, etc. Admittedly, that was before Mr. M of ABM passed away, so ETS may have changed their business model a bit. I finally was able to get a quote through BassLabs. My quote for a 7-string headless set + 7 Tuning Fork bridges (I’m going with a multi-scale design) was 325 Euros + shipping + import duties. Thanks for the feedback on your experiences with them, Ray. And maybe they have changed their business model with ABM out of the picture. But in the interest of completeness, I mention them as another vendor. Interesting, Newbie Brad. It seems they still need to work out issues with their customer service. I didn’t get this at all. When I inquired, my understanding was that I would be able to deal with them directly. I also tried to inquire about a custom bridge or modifying one of theirs, and got brushed off to the bassparts site. Is there anyone in here who has custom milling capabilities that may be interested in doing a custom base plate for a multi-scale 8 string?